An elegant jewelry requires a refined presentation. This layout radiates luxury and leaves no doubt as to what jewelry to choose. Of course, the one presented within it. The upper part of the theme is designed to showcase the main categories of the site. Grid structure helps arrange them in blocks with large images and descriptions. The main content part welcomes the viewers to check out nicely presented featured products and buy them following the 'Add to Cart' button. Get this template and give your website visitors an opportunity to enjoy its elegant black white look and comfortable navigation. cool! It&rsquo;s so cool! You have to try it! The high quality, nicely designed web site template saves us a huge amount of time and effort in creating the professional e-commerce web site. Fantastic functionality in a truly beautiful interface, a wonderful and versatile tool for any small business company who wants to develop an attractive site with a relative thin budget. Support is nice! Thank you Template Monster! Old but nice responsive template. No problem with installation or small editing. I had a few problems with SSL implementation but seems to be opencart related issue and not theme issue. Amazing theme, easy installation , works perfect , a returning customer for sure , thank you templatemonster . Nice template but OpenCart is a crap while this template is used for older version and not for 2.0 and higher .. I am freelancer and a programmer. The reason why I bought this template is because it help to speed up my work and I can finish the work without the draft from designer. I always choose the simple layout design because it look more clean and more easy to use for the visitor. 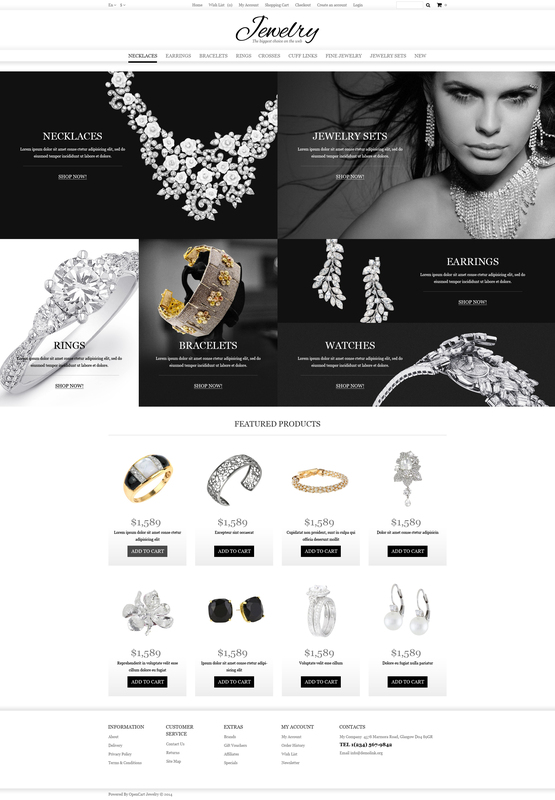 We recently purchased a template for jewelry ecommerce. We decided to buy a template rather than developing for some reasons: - it is much cheaper - the result is a high quality and professional look - we got the result we wanted in days and not weeks We are software developers and have integrated our ERP with Opencart, enabling our clients to integrate their software solution with a powerful ecommerce. When I had any problem about my template your tech team helped me and they were so kind to me. Thank you. Its a nice template and i love it! Is this compatible wuth 2.1.0.1 ? tks. The Same Theme available in Magento ?